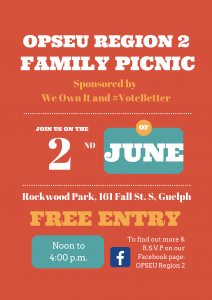 Region 2 is holding a Family Picnic at Rockwood Conservation Area on June 2nd from noon to 4pm. Join us for a BBQ with games, prizes, and a raffle! We will be accepting donations (monetary or non-perishable items) for our locals that are on strike or locked out. Please R.S.V.P. by May 28th either on our event page or to opseu211@gmail.com.